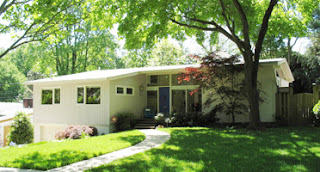 This listing is for a 4/3 for a two-story mid-century located in Chevy Chase’s Somerset Heights neighborhood. The front door looks like it is surrounded by five windows, while the back of the house has a wall of windows as well. Some downsides: the unfortunate wall paper/paint color throughout the house, but that is easy to change. Also, it looks like Little Falls Parkway runs near the house, so there could be some traffic noise issues. Here are some pictures.